Tea tree oil possesses purifying qualities that make it an excellent addition to natural cleaning solutions. Used topically, it helps promote healthy skin and a balanced scalp. When taken internally, tea tree oil may help keep your immune system healthy. To add a unique, enjoyable scent to the air, consider diffusing several drops of tea tree oil. 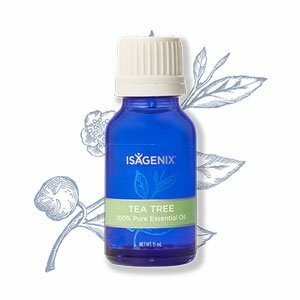 Topical – Take a drop of tea tree oil and combine it with Isagenix Essence Coconut Application Oil, about 10 to 12 drops, and apply the mixture directly to your skin. Internal – In 4 ounces of the liquid of your choice, add one drop of tea tree oil. Aromatic – Use your Isagenix Essence Aromatic Cool Mist Diffuser with up to 10 drops of tea tree oil.